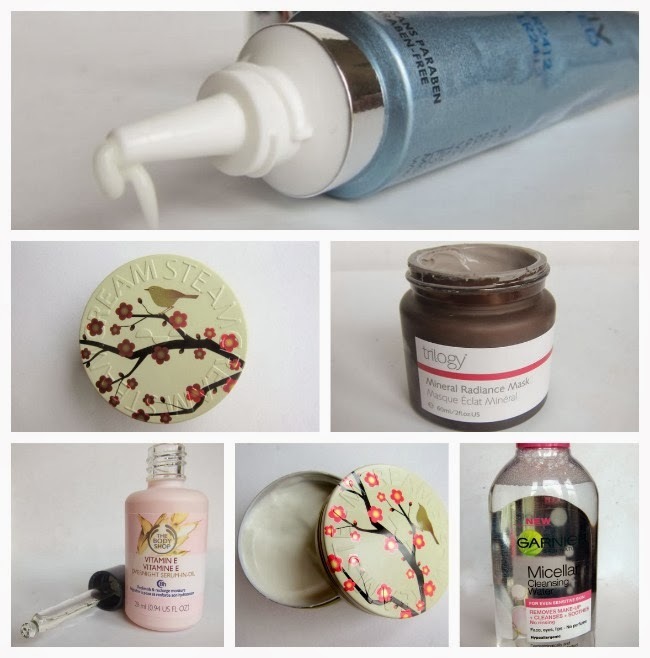 Gather round my fellow seekers of the Beauty Holy Grails: I have no less than FIVE amazing, affordable discoveries (some new, some new to me) that you have to know about RIGHT NOW. ONE: I knew Steamcream would look pretty – this multi-purpose, natural moisturiser comes presented in a huge variety of gorgeous designer tins (this one is the Ume Ni Uguisu design). I wasn’t prepared for it to smell as beautiful as it does, or for its soothing, gentle care of my weather beaten, post-winter skin. Both benefits can be attributed to the all-natural, vegan ingredients list: orange blossom, rose and lavender oils give it that delectable fragrance while palm-free, vegetable glycerine holds moisture in the skin. I’m using it on my face, my hands and my elbows, and it’s great value, too: ASOS carry a pretty edit of limited-edition tins, priced at €18.26 for 75g. TWO: The Body Shop’s new Vitamin E Overnight Serum-In-Oil is delightful. Packed with skincare goodies like wheatgerm, jojoba, sesame and maruba oils, this still manages to be really lightweight and easily absorbed. Use it at night and awaken to soft, plumped up skin. No congestion issues with my oily t-zone, either, and the dinky wee bottle feels very high class. All that,for €22? I’ll take two. THREE: I’ve been lashing on Trilogy’s latest launch, the Mineral Radiance Mask, like nobody’s business since it landed on my desk a week or two ago. One of the loveliest clay masks I own (and I own a few), this creamy, dark grey wonder does two fab jobs in one: the kaolin deep cleanses, drawing out impurities, while botanical extracts nourish and hydrate. Trilogy's in-house beauty expert, Corinne Morley, says the mask is suitable for all skintypes. "If your skin is dry or dehydrated", she says, using the mask "once or twice a month will help keep it soft and hydated. On the other hand, if your skin tends to oiliness, applying the mask weekly will ensure your skin benefits from the deep cleansing and purifying action." My combination skin won’t be without it now, so I was fearful of the price – clay masks can be spendy. Now, are you sitting down? It’s €23.95. I KNOW! I’ll be stocking up on payday. FOUR: I went mad for the L’Oreal micellar (it even made my Beauty Year In Review) but, if anything, I like this Garnier newbie even more. It’s massive, for a start – 400ml, which we’re told will last for 200 uses – and, just like my favourite Evian water, the curvy, pink capped bottle is aesthetically and kinesthetically pleasing (meaning it’s pretty and fits nicely in my hand). The price tag’s appealing, too – it’s €7.69, though you could find it for cheaper in Boots. Perfume free, it’s a great pick for sensitive skins and forms part of my nightly routine, gently removing my makeup before I go in with my facecloth. FIVE: So I just had a birthday and was forced to conclude that those dehydration lines on my forehead may not be quite so temporary. But help is at hand in the form of Vichy’s high-tech Liftactiv Advanced Filler, €35. With retinol and that magic active ingredient, LR2412 (a derivative of jasmonic acid, found in Lancome’s Visionnaire and, in smaller quantities, Vichy’s Idealia Life serum) this promises to smooth our surface wrinkles and fill in those deeper vertical lines. It’s being diligently smoothed across my forehead every night. Tried 'em? Loved 'em? Fancy giving anything a whirl? Share your thoughts in the comments!